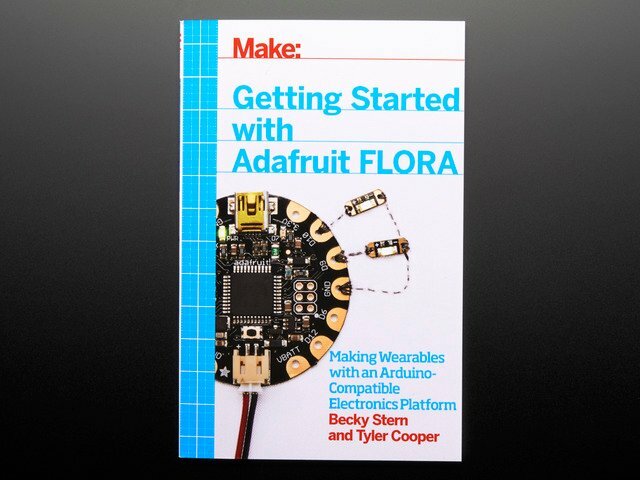 FLORA is Adafruit's wearable electronics platform. 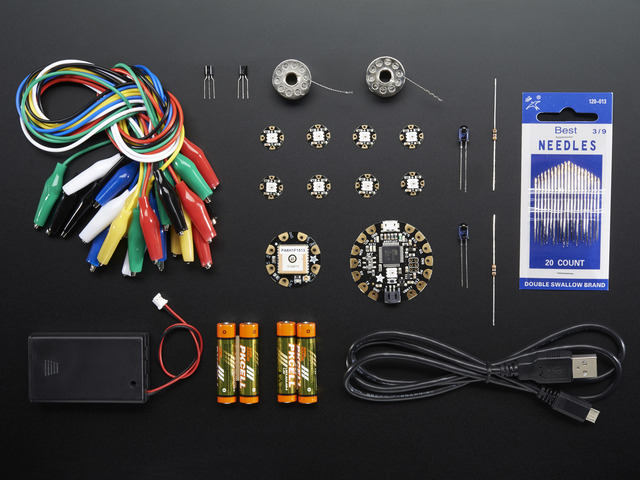 We designed it from the ground up to provide the best experience for Adafruit's community of makers, hackers, crafters, artists, designers and engineers. It's built around the Atmega32u4 chip, which has built-in USB support. 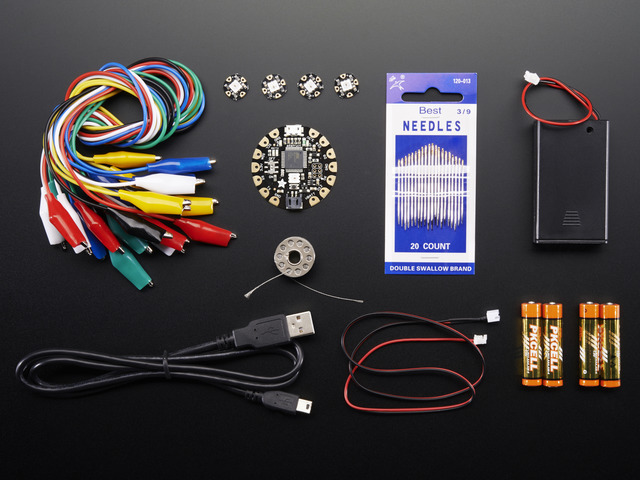 No pesky special cables or extra parts for programming, just plug it in and get started making the wearables project of your dreams! Works on Windows and Mac. The FLORA is extremely beginner-friendly-- it is difficult to destroy the FLORA by connecting a battery backwards due to polarized connector and protection diodes. The onboard regulator means that even connecting a 9V battery will not result in damage or tears. 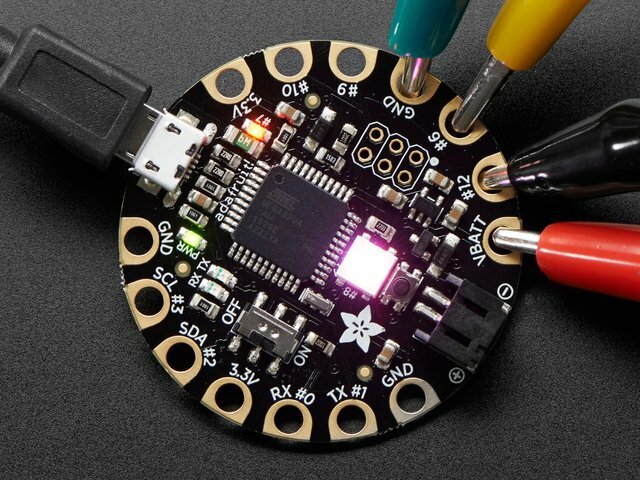 This guide is the first step in using FLORA, plugging it in and programming it to blink its onboard LED! After that you can move on to our Flora RGB Smart Pixels tutorial and/or Flora GPS tutorial. 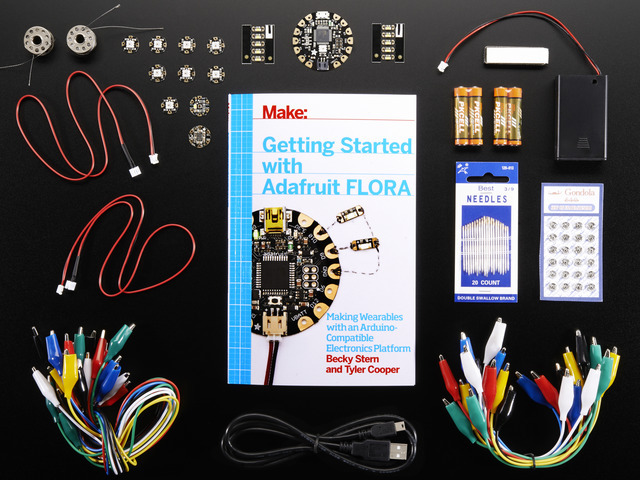 Adafruit created the FLORA from scratch after many months of research and we really think we came up with something that will empower some amazing wearable projects. The FLORA is small (1.75" diameter). We wanted the smallest possible board for our wearable platform. It's based on our experiences shipping our own, shipping, customer-tested Atmega32u4 Breakout Board. FLORA has a small but easy to use onboard reset button to reboot the system. The power supply is deigned to be flexible and easy to use. There is an onboard polarized 2 JST battery connector with protection schottky diode for use with external battery packs from 3.5v to 9v DC in (It can run on 3V but 3.5V-5V or higher is ideal). Can be used with LiIon/LiPoly, LiFe, alkaline or rechargeable NiMh/NiCad batteries of any size. The FLORA does not have a LiPo charger included by design, this allows safe use with multiple battery types and reduces risk of fire as it is not recommended to charge these batteries on fabric. FLORA has built-in USB support. Built in USB means you plug it in to program it, it just shows up. No additional purchases are needed! Works with Mac, Windows, Linux, any USB cable works great. Currently the PCB comes with a mini B connector but future versions may change to microUSB. The FLORA has USB HID support, so it can act like a mouse or keyboard, etc. When you're finished installing the IDE come back to this page to continue the Flora guide. // Pin D7 has an LED connected on FLORA. From the Tools menu, under "Board," choose "Adafruit Flora"
Also in the Tools menu, under "Serial Port," choose the one that contains the phrase "usbmodem" if you have a Mac. If you're using a Windows computer, it will be named COMsomething, but not COM1 or COM2 (so it will be whatever comes after those two if they exist, such as COM3 or COM4). Press the Upload button to transmit the program to the FLORA. It looks like an arrow pointing to the right. That's it! The on board LED marked "D7" should blink on and off repeatedly, and you've successfully programmed your FLORA! Install and close out the Library manager. If you're not able to use the library manager or have an older IDE, you can always 'manually' install the library! The Flora runs at 3.3V with an onboard regulator to keep the voltage steady. You'll need to power the board with a 3.6V or greater battery. For that reason, we find 3 x AA or AAA or a lithium-polymer battery to be ideal. You can only power FLORA through its onboard JST port. After loading your program onto the FLORA, you'll want to unplug the USB cable and go portable with battery power! USB will always power the board, but battery power (through the JST connector) can be turned on and off with Flora's onboard switch (near the "ON" text on the board). We recommend our 3xAAA holder for beginners, which conveniently plugs into FLORAs JST port. More advanced users may wish to use a rechargeable lithium polymer battery for their smaller size and longer duration. These batteries pose added risk if abused, shorted, bent, crushed, or punctured. FLORA does not have onboard charging, so you would also need a separate LiPoly charger. This guide was first published on Nov 08, 2012. It was last updated on Nov 08, 2012.